As a professional shaveologist I am always being asked for advice on how to achieve a barbershop shave at home. Most guys struggle with some aspect of their daily shave. If you look at things that women do daily – hair, nails, makeup – there is a seemingly limitless amount of advice and information out there to help them. It seems that men are expected to know instinctively how to shave, and being men we probably wouldn’t listen to advice anyway! There are some shaving guides out there, but I find that they are quite cursory and are usually focused on telling you what to do. In my experience men respond better to a ‘Haynes Manual’ approach, explaining not only the how but the why as well. So, after many years shaving other mens faces, and even longer shaving my own, I’m going to take you on a step by step guide of not only how to shave, but how to enjoy it as well. Men start to get facial hair at puberty, and this continues for the rest of their lives. From my experience I know that every mans beard growth is different. There are so many variables – speed of growth, density of growth, direction of growth, coarseness of growth. Each of these has to be considered in the shave. When we’re looking for a close, enjoyable home shave there are four factors that must be considered; equipment, preparation, the shave, finish/aftercare. We’re going to look at each of these in detail, I’ll give you some options for best practise, and we’ll also look at common mistakes and how to avoid them. This covers the ‘hardware’ and the shaving products you use with it. 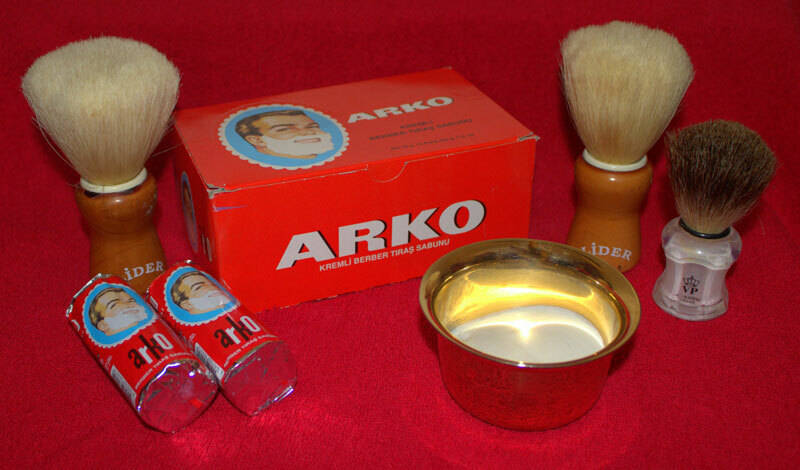 Most commonly guys who wet shave will use a cartridge type razor. These are multi bladed razors, usually with three to five blades set at a fixed angle within a disposable unit. There is nothing wrong with these razors if used properly. You can get a great shave with them, but because they are quite expensive (typically £1-2 per cartridge) there is a temptation to use them for too long. From talking to lots of guys, and studying the internet shave forums (geeky I know!) 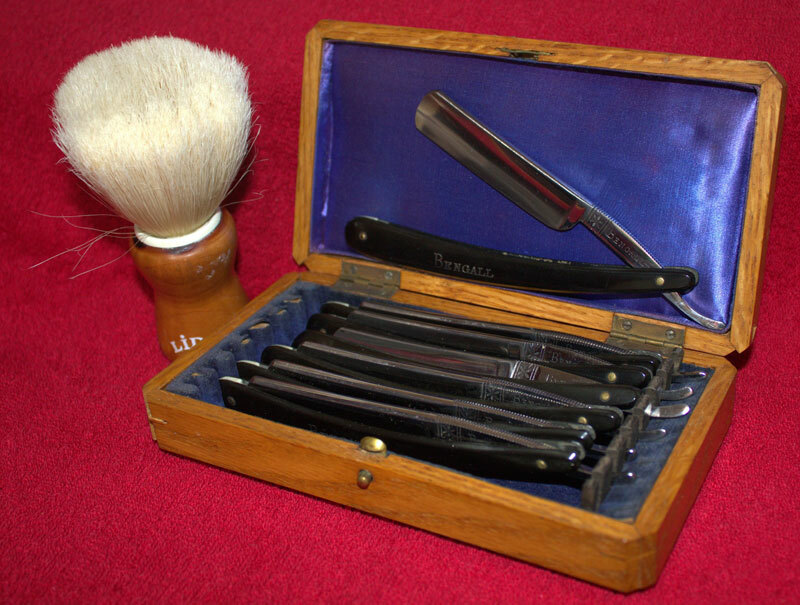 the concensus seems to be that each cartridge starts to become duller (less effective hair cutting and more irritating on the skin) after about 5-10 shaves, and that the blades start to deteriorate after the first shave, so if you only shave once a week you will get less shaves. There are a couple of alternatives if you want to try something different to cartridge blades. Firstly there is the DE (double edge) or safety razor. These use a traditional razor blade and are what everyone used before the disposable cartridge razor became available. These are becoming increasingly popular again. To a certain extent cost is a factor in this. A good razor will cost upwards of £30, but then blades are only 10-20p. It is also a more satisfying shave, and there are environmental concerns for some people about the amount of waste created by cartridge razors. It should be noted that they’re called ‘safety’ razors in comparison to cutthroat razors – these razors take a bit of getting used too! Secondly there is the straight or cutthroat razor. This is as old school as it gets, but requires even more practise to get right. These razors represent a real step up in shaving skills and technique, so I shall be shortly doing a dedicated article on how to shave with these razors, along with tips and advice on different makes, styles and blades. So that’s the razors, let’s now look at shaving soaps, creams, gels, oils and foams, what they do, and how to get them onto your face. The primary function of all of these is to give a layer of lubrication to enable to the razor to glide smoothly over the face. So it’s important that you make sure you are getting the product where it’s needed – on the skin, not on top of the beard growth. There are two methods to lather the face, by hand or by shaving brush. If you are going to use your fingers make sure that you are not just spreading the product over the top of the beard growth. This is next to useless and will lead to irritation as when the razor cuts the hair it will be moving over skin with no lubrication. So massage the product down through the whiskers to the skin. Shaving brushes come in many shapes, sizes and varieties, badger being the most well known (and expensive), but you can get boar and horsehair brushes, and some pretty good synthetic ones. Badger brushes will produce a great lather, but I find them to be a little soft. If you are trying to work a lather down through several days of growth I much prefer a firmer bristled boar or horsehair brush. They also have the advantage of ‘massaging’ the skin and making it more pliable. We will see the benefit of this when we get to the preparation section. That’s the hardware covered, let’s now look at the actual products available, and how best to use them. Usually I try to find some good in all products, but unfortunately this doesn’t apply to shaving foam. Foam doesn’t do anything that a soap, cream, foam or oil won’t do better! Because it is squirted form the can under pressure it is full of large bubbles of propellant which sit on the skin and prevent it from doing its job of lubrication. You could squirt it into your hand and break down the bubbles with a shaving brush and then apply it to the face, but, quite frankly, why bother when there are far superior products available? Gels are fairly new to the market and provide adequate lubrication if massaged into the beard area thoroughly. Shaving oils are also a fairly new innovation. You’ll find a lot of them are labelled ‘pre shave oil’, and instruct you to massage them into the beard area before applying cream or soap. This is a marketing mans dream, getting the consumer to use two products when they only need one! Provided you prepare the face as per the guide in the next section you should not need to use anything else. However, that doesn’t mean that oils should be disregarded. It is possible to get a good shave using oil, although I find it a bit messy and greasy, especially if you’re the one who has to clean the sink! But they do come into their own for those occasional super smooth shaves. If you shave normally then rub some oil onto your face you’ll be able to easily pick out any areas that can go a little closer, and the extra lubrication the oil provides helps to cut down on irritation. For me it is hard to beat a lovely thick lather applied with a shaving brush. Shaving soap (hard) and cream (soft) will each give a great lather. There is a huge choice with different styles, scents, manufacturers and finishes, so for the purposes of this article I can only recommend that you try as many as you can. I will be doing a separate article dedicated to shaving soaps and creams, what to look for and what to avoid. 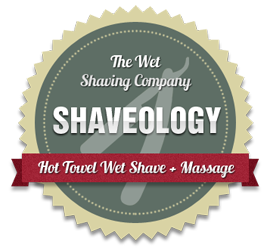 As you can see there is a bewildering array of shaving equipment and products, but with some research and experimentation you can come up with the perfect combination for you. Now let’s move on to the hands on stuff – the shave itself. Firstly, some anatomy. The hairs on the face are not uniform in their coarseness or density. They range from very fine vellus hair on the cheek bones to thick, bristly beard growth which increases in coarseness and density the closer you get to the mouth. Obviously the thicker (coarser) each individual hair is, and the more of them there are per square centimetre, the more challenging the shave. Add to this the fact that these hairs grow in different directions across the face and it’s no wonder that some men struggle. Many men aren’t aware of the direction that their beard grows in, so let’s map this first. Don’t shave for a couple of days and then run your fingers all over your beard area in different directions. The direction in which you feel the ‘rasp’ is going against the direction of hair growth. Shaving regularly in this direction is going to lead to shaving burn and rash, and even ingrowing hairs. All of these are uncomfortable and unsightly. To prevent these happening, only shave with or across the direction of the hair growth. We’ll look at this in greater detail later. The beard bristles grow with a thick, oily protective layer. If you strip this off by washing with hot, soapy water the bristles become very absorbant. The more water they absorb the softer they become and the easier they are to shave. If you wash thoroughly then hold a hot, wet flannel across your beard area your shave will become noticeably easier and more comfortable. Another benefit is that the heat makes the skin more pliable. The more pliable the skin the tighter it can be pulled and the closer the shave. We now know which directions the hair grows in and have prepared the face with piping hot water and soap. Now we need to apply the lubrication, shaving soap, cream, oil or gel. I personally would recommend working up a thick lather with either soap or cream and a shaving brush. Don’t skimp on this part. Work that lather fully into the beard growth to get it down onto the skin where it’s required. This will also continue to work the skin itself and make it even more pliable. 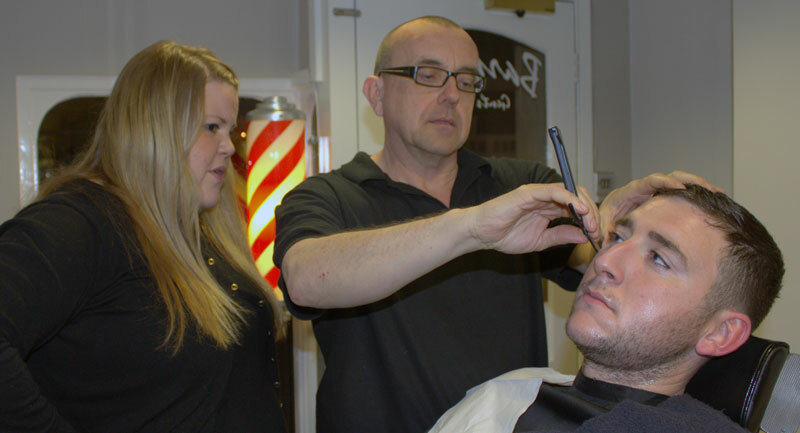 Take your time in this preparation, it really will make a huge difference to the closeness and comfort of your shave. You’ve done the preparation and now you’re ready to shave those bristles! Firstly, let’s consider the four things that most guys get wrong – a) not pulling the skin tight enough, b) shaving too fast, c) shaving against the direction of hair growth and d) trying to shave too close. A) Not pulling skin tight enough. If you watch yourself in the mirror you will be familiar with the faces we all pull when we shave. We do this to stretch the skin, but why and is it enough? The bristles don’t grow straight out of the skin, but lying against it. If we pull the skin back away from the direction in which they’re growing it stretches the skin and lifts the bristles. This makes it easier for the razor to cut the hairs. Pulling faces does stretch the skin, but it is far, far more effective if we also use our free hand to pull back on the skin. Part of the preparation was to make the skin more pliable and obviously the more pliable the skin the farther it will stretch and the more upright the bristles become. You have to give the razor blade enough time to do its job. The quicker you move the razor over the skin the more likely it is to get clogged with bristles and start to skip and tug on hairs. This leads to you having to keep going over the same area and leads to more irritation. This is also the case if you use too long a stroke over the face. So slow down the speed of your razor by at least half, and shave in small 0.5-1cm strokes, lifting the blade off the face in between, and rinse the razor often. If you do this you should find that you don’t have to keep going over the same area. In the interest of speed and smoothness lots of guys will shave back against the growth direction. Quite often this is also due to an ignorance of which way the hair grows. The action of dragging a razor ‘against the grain’ is twofold. Firstly because of the tensile strength of the coarsest bristles the razor won’t cut them but tug and pull them roughly from the skin. This will quickly result in red, angry, sore skin (razor burn) and can lead to infections in the individual hair follicles (folliculitis) which appears as clusters of white headed spots (razor rash). Secondly the angle the hairs get cut at means that as they continue to grow there will be a tendency for them to push back under the skin and become ingrown. Shaving strokes should follow the direction of the growth, or go across it. There are, of course, many angles that can be used going across, but they shouldn’t exceed 90 degrees to the direction of growth. Shaving like this will give you a great, everyday shave. However, it is OK to shave against the growth very occasionally to get what the Turkish call a ‘glass shave’, super close for a special occasion. Right, let’s get this clear – you are a man, you grow bristly hairs on your face, accept the fact that you are never going to be 12 years old again and have baby smooth skin! This is the number 1 cause of most of the problems that men have, an unrealistic expectation of what their face should look/feel like after a shave. Try this after your next shave – run your fingers all over your face like earlier. If it feels smooth when you go with and across the direction of growth then it’s close enough. You may still feel a rasp going against the growth, but that’s normal. To get rid of this you’d need to shave against the growth which leads to the problems above. Another problem some guys have, especially those with heavy, dark beard growths, is looking in the mirror after a shave and seeing that dark, Homer Simpson-ish shadow, and then trying to shave closer to get rid of it. Our skin is translucent so dark hairs will show through the skin. Try to ignore the mirror and do the touch test above, that is as close as you should be aiming for. One question I’m often asked is why a shave with 2-3 days growth is so much smoother than one with one days growth. The answer to this is another reason that some guys over shave. The individual hairs grow at different speeds. After 2-3 days all the hairs are long enough to be caught by the razor. After just one days growth there will be a percentage of hairs that are long enough to feel, but too short for the razor to catch. No matter how many times you go over an area, or in which direction, you won’t be able to shave these hairs. If this is a problem for you then perhaps you should consider trying a 36 hour shaving cycle rather than a 24 hour one. So if you shave Monday morning your next shave will be Tuesday evening and then Thursday morning. This is often a good balance between being groomed and tidy, and preventing over shaving. As a general rule I’d also advise having one day a week off from shaving to give your skin a chance to recover. Wow, there seems to be a lot of don’ts so far, so let’s put all the positives together in a shave. This would be my preferred routine. That’s not to say it’s right, or right for you. Once you have mastered the basics of how to shave comfortably then you can start to experiment and build your own perfect shave. Our imaginary model is right handed and has a typical hair growth pattern – beard growing straight down on both cheeks, down on the upper lip, down under the mouth but slightly out at the chin. Neck is generally down, but grows upward at the collar line (this change of direction along the collar line is the most common area for problems). He’s prepared the face with a nice thick lather, and we’re ready to go. Taking hold of the left ear with the left hand and pulling back stretches the skin across the cheekbone. Shave in short strokes towards the nose, moving the stretching hand forward so that it remains about 5cm behind the razor to give maximum tightness on the skin. Repeat this in 3-4 strips working down across the cheek until it is all shaved. This area has now been shaved across the growth and should feel pretty smooth. If it needs to go a little closer shave back towards the ear, going the other way across the growth. Shave the right cheek in the same way. Unless you are ambidextrous this will be a little more difficult as you will need to cross your hands to get your left hand on your right ear. Next shave the top lip, downwards, with the fingers of the left hand pulling from above on the cheekbone. If this needs to go a bit closer shave outwards. The neck can be shaved outwards with the left hand holding along the line of the Adams Apple. This leaves the bottom lip and chin area. The growth is densest here, so slow things down even more. I would shave out from the centre line, going down if it needs to go closer. Of course many men are going to have other problem areas – moles, spots, scar tissue and previously damaged skin – to deal with. Sometimes these can be dealt with by stretching the skin extra tight and shaving very gently. This doesn’t always work and, if you enjoy shaving and want to continue doing it then it might be worth getting a small electric razor to go over the problem areas and wet shaving the rest of the face. So, the shave is finished, let’s dry the face and get out of here? Yes and no. that’s exactly what most guys do and it doesn’t seem to cause them any problems. However, a few minutes spent now on skin care can mean that subsequent shaves get easier and more comfortable. Immediately post-shave you should deal with any small nicks or blood spots, to stop any chance of infection. A small investment in an Alum Block of Styptic Pencil is worthwhile. The active ingredient is Aluminium Sulphate, which is an astringent that tightens the tissue and stops any bleeding immediately. A generous amount of moisturiser massaged into the skin now will have the maximum benefit as the pores are still open and it will quickly and easily absorbed. This will keep the skin supple and prevent it getting dry. If you now hold a cold flannel over the shaved area it will close the pores and tighten the skin. Traditionally this would have been achieved with a handful of cologne or rubbing all over with an Alum Block Both of these methods are quite painful! The cold flannel takes away a lot of the heat from the shaved area and reduces redness. I like to finish with a light dusting of talcum powder to dry the face, rather than rubbing with a towel. If you like to wear cologne or aftershave apply it now, although I’d probably only put it on the back of the neck or chest. So, here we are, 3000+ words to describe what most men do unthinkingly in front of the mirror every morning. It’s impossible to write a guide that is going to be able to tell every man exactly how to shave, there are far too many variables for that. What I’ve aimed for in this article is to give you an overview of how to get the best from your shaving technique and equipment. It’s been calculated that the average man will spend up to six months of his life shaving – why not learn to enjoy it!